Britain's biggest payday loan company Wonga has collapsed and begun the process of appointing administrators. The firm's folding confirmed Sky News' report on Sunday that the company was on the brink of collapse following a deluge of customer compensation claims. Wonga's descent into administration also comes weeks after Sky News reported that the loans company had received an emergency €10m cash injection from a consortium of high-profile technology investors.At the time, chief executive Tara Kneafsey‎ warned shareholders that Wonga was in danger of becoming insolvent.One insider told Sky News that the cash call had prompted a fresh surge in compensation demands from claims management companies (CMCs).In a statement, Wonga said: "Chris Laverty, Daniel Smith and Andrew Charters of Grant Thornton UK LLP are in the process of being appointed as joint administrators. "Wonga customers can continue to use Wonga services to manage their existing loans but the UK business will not be accepting any new loan applications. Customers can find further information on the website. 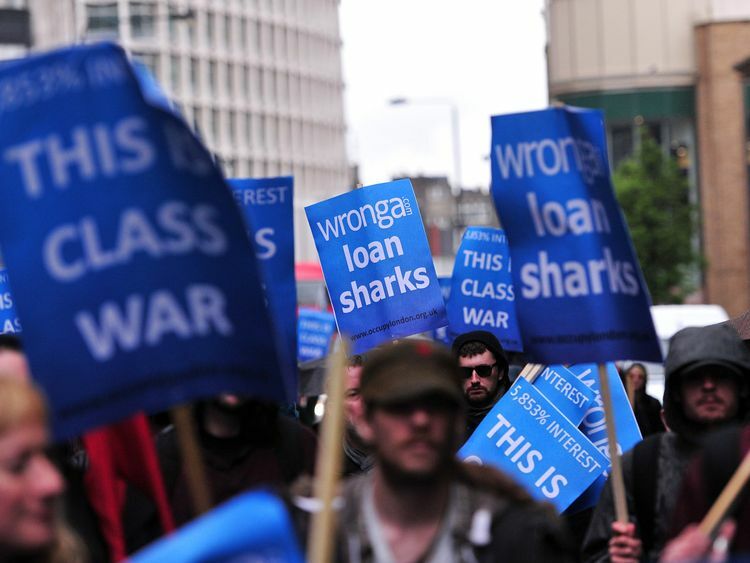 "The company said its overseas businesses would continue to trade and were not part of the administration process.Wonga was once one of Britain's fastest-growing consumer finance companies, but it faced a barrage of criticism over the high interest it charged on its loans and has been accused of targeting the financially vulnerable.In 2014, the firm introduced a new management team and wrote off €220m worth of debt belonging to 330,000 customers after admitting giving loans to people who could not afford to repay them. Its collapse underscores Wonga's remarkable decline just five years after it harboured ambitions of pursuing a New York stock market listing. Such a move could have valued the company at more than $1bn and turned it into a British technology 'unicorn'.The company's most recent accounts show it made a loss of €66.5m in 2016.The Financial Conduct Authority said that insolvency specialists Grant Thornton plan to update customers once Wonga is officially in administration.But in the meantime, Wonga's remaining 220,000 customers are being urged not to be tempted to stop making repayments. "The FCA will continue to supervise Wonga once it is in administration and is in close contact with the proposed administrators with regard to the fair treatment of customers," it said. "Customers should continue to make any outstanding payments in the normal way. "All existing agreements remain in place and will not be affected by the proposed administration." Caroline Siarkiewicz, head of UK debt advice at the independent Money Advice Service (MAS), said: "While some may see today's news and be tempted to stop repayments, it is important they carry on as normal. "Regardless of ongoing speculation over the future of Wonga, customers who have entered into a loan agreement must fulfil it."